Since this is my blog san says I should be the first to write in it. I think THAT is only right. (see my first pun...hahaha). san says I am quite a funny kitty. I think she means I have a sense of humour, not that I am funny (in a funnyfarm way). san wants me to tell you if you have come here to check us out, this blog will be our way of keeping tabs on our journey to get RID offur my kidney stones. This will mean that our offur blog Cat Tales will be for offur things but she will post about all offur us there too. 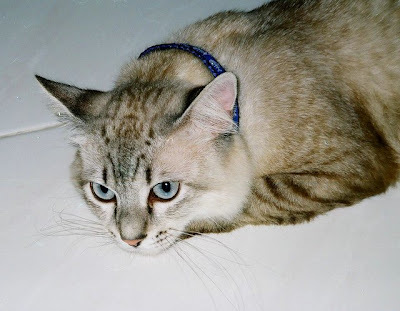 My other bruffer megat also has his own blog Journey into Life for his fight wif lymphoma. But he is now better and we hope will stay clear offur that dreadful cancer. san will talk about my medications and modifications if any in this blog so its easier for her to track them and for any other people too, if they also have cats with kidney problems. san says it is also easier for other kidney kitties who may want to talk about their own journeys and maybe we can do this more easily. Toro-Chan! So now you have your own blog! We will of course be checking in, and still continue to check in on CAT TALES!